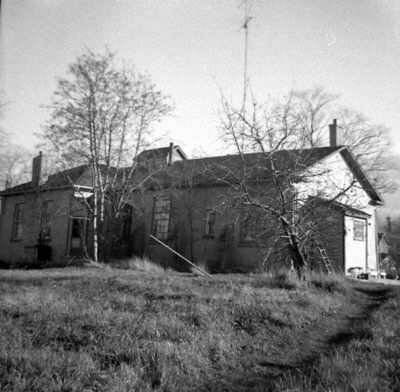 Black and white photograph of Dufferin Street School. View is of the north side of the school. Dufferin Street School was built in 1851 on the west side of Dufferin Street south of Victoria Street. It served as the school for Port Whitby from 1852-1915 when it was replaced by Brock Street School. Dufferin Street School has been a private residence since 1916. Dufferin Street School, February 1963, Brian Winter. Whitby Archives A2013_004_197.